Workers prepare for the final hydraulic test in the Plum Brook Reactor. 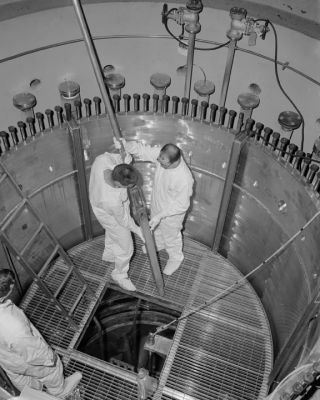 In this historical photo from the U.S. space agency, Jack Crooks (right) and Jerold Hatton work inside the reactor tank in preparation for the initial startup of the Plum Brook Reactor. They are inserting dummy fuel elements into the core as part of the final hydraulic testing.